But she was still frustrated. On average, we discard 1 million plastic bags every minute, worldwide. Each bag is used for about 25 minutes, then takes another 100-500 years to decompose. Our plastic trash flows to streams, rivers, and the oceans, where it’s ultimately drawn into the center of a whirlpool-like ocean gyre and trapped. Over time, the plastic breaks down into microscopic pieces that pollute our oceans and kill sea life. 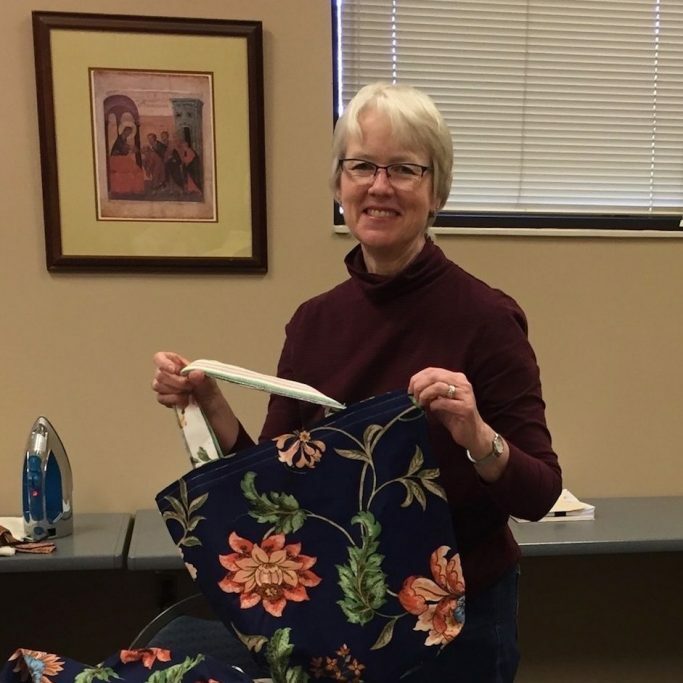 Nowadays, a dedicated crew of women in Nashville and Denver, Colorado (where Teresa now lives) meet twice a month to produce and assemble a mountain of cloth bags. They fold and cut fabric, attach handles with a contrasting pattern, iron, and sew. The bags are numbered and labeled as they are produced. “Everyone has a specialty, and it’s a very fluid process,” comments Teresa. The sturdy, eye-catching bags are given to anyone who will promise to use them in lieu of plastic while shopping. The Green Bag Ladies willingly offer them to other shoppers or interested community groups. They’ve handed them out at farmer’s markets and grocery stores, and even distributed them to city council representatives, hoping to encourage civic discussion of ways to decrease plastic refuse in our communities. But still, Kathleen says, “the group would love to see more of the bags around Nashville.” She and her co-volunteers are disappointed so many people continue to use high numbers of plastic bags, and cities haven’t done more to stem the flood of plastic to our oceans and landfills. After moving to Denver in 2013, Teresa discovered Green Bag Lady was a good way to integrate into her new city. Along with managerial and coordinator duties, “Chief Bagette” Teresa is still very much involved on the bag assembly line in the Denver chapter she founded. Although the Nashville Green Bag Lady group—the very first one—holds a special place in her heart, she’s guided the beginnings of 32 (and counting!) more chapters around the globe. A chapter consists of 1 or more people who make 10 or more bags per month.